There’s never been a better time to straighten your teeth, with the most advanced clear aligner in the world. Our office is proud to be a certified provider of Invisalign clear aligners, which give you a clear, convenient, and comfortable option to achieve the smile you’ve always wanted. Proven results: SmartTrack® material and SmartForce® features are clinically proven to improve control of tooth movement with Invisalign clear aligners. We will take impressions of your teeth, then map out a precise treatment plan, including the exact movements of your teeth and how long your treatment will be. You’ll even get to see how your teeth will move and preview your new smile. When your treatment is complete, ask us about a Vivera® retainer. 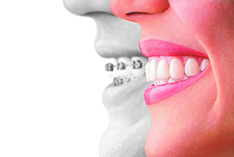 These are custom made using the same state-of-the-art technology as Invisalign clear aligners.